Consistent determination propelled David into a lucrative fitness class. See how he overhauled his life and went from 28 to nine percent body fat! I had knee surgery seven years ago and used the excuse as a crutch. I never cared about fitness before. My reckless diet and lack of physical effort contributed to a growing waistline and growing depression about how I looked. I grew up dreaming to look like my favorite super heroes, but always made excuses why I couldn't reach it. In December 2011, I deployed as a member of the Georgia Air National Guard. My wife and I found out we were expecting our first child, a little girl. Anyone who has deployed for the armed services can tell you this is when most people decide to lose a few pounds and hit the gym. I did it before and gained everything back when I was back stateside, but this time was different. My daughter was at the forefront of my mind and I took a hard look at myself. I weighed 240 pounds and got tired walking up stairs. Several coworkers made jokes about my expanding waistline. I tried to dress and hide my weight. I was starting to feel like my beautiful wife, who has always been in good shape, was on a completely different planet. I felt like we were becoming a stereotypical sitcom couple: skinny wife/fat husband. I felt shame. It was one thing in my life I had control over. I decided this deployment would be the beginning of a new life. My daughter would never know her dad to be so out of shape he couldn't play with her, or worse, be there for her. 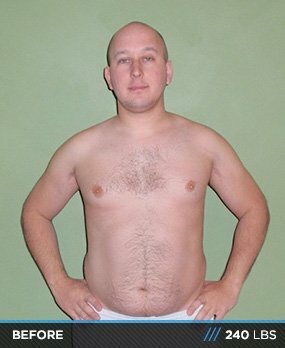 I started to search the Internet for a way to reach my goals and found Bodybuilding.com's transformations. I spent hours reading the sections: men, women, over 40. I was in awe at how regular people like me managed to achieve their goals, some with greater weight loss than mine. I was inspired. Bodybuilding quickly became my hobby. When I returned home from deployment, I lost 25 pounds. This is usually when everyone goes back to old habits and packs on weight. Fortunately I had inspiration. My wife, Nicci, (after having our beautiful daughter Alayna) decided to step up her fitness too. She became my biggest supporter and I could not have done it without her. She talked me through hard dieting days and cheered me on when I hit goals. She completely changed how she cooked meals and searched the Internet for healthier versions of foods we loved. She knew how bad I wanted to change and underwent her transformation to become a lean machine. If there was a day I wanted to skip the gym or blow my diet, she was there to push me. Now we inspire each other and I love that we share the hobby together. I love to inspire and motivate people to change their lives. I remember how badly I wanted to change, but needed someone to show me the way. It's incredibly rewarding to give back. I encourage everyone to share their journey. You never know what greatness you will inspire. It's been a big change. I'm in the beginning of a long journey to create the most aesthetic physique I can. I wanted to look like the guys I saw on stage, in the forums and magazines. Now I just want to be the best me I can be. When I first started to work out, I tried to throw as much heavy weight around as possible and stayed injured. My diet was inconsistent, but I dropped pounds and assumed that drastic calorie cutting and insane training was optimal. I trained this way for a year and hit a plateau around 200 pounds. I was frustrated, sore, and tired of not eating what I wanted. 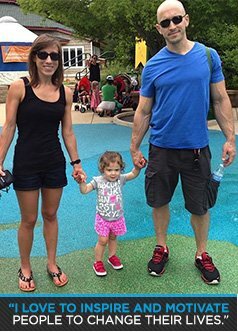 It motivated me to cut through bodybuilding myths and get to the science behind training, nutrition, and supplementation. During my research, I stumbled across John Otis Hollywood. I liked his approach and could see he was a man who knew what he was talking about and would get the best out of me. I achieved decent results on my own, but was curious to see what a coach could do for me. Under his coaching, we fixed my broken metabolism and I started to see changes on a new level. I began using his power/hypertrophy-split routine and still enjoy using a version of it today. I lifted heavy weight, but had "bodybuilder" days where I focused on time under tension in a high rep range. I also changed my approach to nutrition. Flexible dieting (if it fits your macros) enabled me to eat fun food with chicken breast, oatmeal, and veggies. It saved my sanity and changed how I viewed food. It made me feel normal again. Having a coach took the guesswork out of my diet and training, and added pressure to the weekly pictures I had to take and send in. It kept me honest and gave me a great resource. I found awesome and inspiring teammates on Team Hollywood, aka the Hollywood Militia. I highly recommend a coach for anyone who wants to take the next step. I focused on flexible dieting and tracking macronutrients. I set a goal of protein, carbs, and fats to hit each day, and picked whatever food I wanted to fill those and made sure to eat mostly nutrient-dense and micronutrient-rich food. I received weekly macros that changed based on training and off days. My passion for lifting came quickly, but cardio has always been the enemy. It's a necessary evil. I've been good about dieting, but that's because my wife makes sure we have delicious low-calorie, macro-friendly meals for dinner. That was the key to my success. My plans are to finish my cut, start reverse-dieting, and do my first bulk. I'm just getting started with my transformation and can't wait to see results in a few years. I love to pass on lessons I learned to friends, family, and coworkers. I made my share of mistakes along the way, but want to encourage and inspire those like me and show them the path and tools to achieve their dreams. Dieting is the key component to lose weight and achieve your goals. Stop ego lifting! You don't impress anyone. Focus on controlling the weight and stimulating the muscle. Slow progress is progress. Take pictures to see how far you came. Everyone starts somewhere. Be kind to those who are learning. I spent lots of time on Bodybuilding.com. Aside from the transformation section which had the largest influence, I spent plenty of time in the trainers section. I read every article on the site to learn new training techniques. My wife is a Jamie Eason fan, so many of her recipes appear on my table. I love having food that satisfies my sweet tooth and fits my nutritional goals. I'm a supplement junkie. I always read up on the latest and greatest and the site reviews help me make informed decisions. 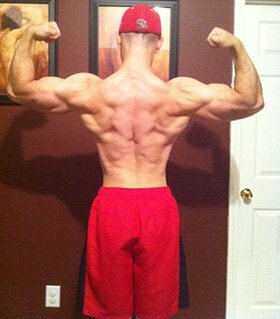 Thanks to Bodybuilding.com for allowing me to share my transformation. I hope it inspires and motivates people to change. Thanks to my coach, John Otis Hollywood, and fellow Hollywood Militia coach, Marc Lobliner. Thanks to my teammates for daily inspiration and meal ideas. I wouldn't be here without my beautiful wife, Nicci. Thanks for being there and for driving and reminding me what the struggle was for. You and Alayna are my world.